Music is a fun addition to just about any activity. 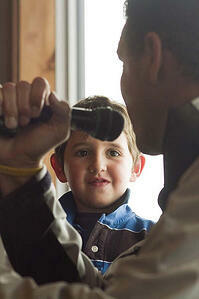 Adults and children alike appreciate singing along or busting a move to their favorite song. It is important for parents to encourage children’s love of music when they are young, so we want to give you 11 ways to include music in your everyday life that will be fun for you and your kids. Have music playing in the background when you are at home or in the car. It is as easy as that. Music can act as a calming backdrop to your life. Let music become a part of life for your kids. Take it a step further and make your own music. Grab an instrument and play with your child. You don’t even have to use a common instrument. You can let them make a beat against the coffee table while you sing. With younger kids you can even lightly play a beat on their tummies. They think it’s funny and it brings rhythm and music into their lives. Get up and move. Most kids love to dance. Turn on a fun song, grab your kids, and let loose. Hold their hands and dance or just make your own silly dance. They will enjoy being silly with you. If your child is younger, you can clap their hands together or help them do a little wiggle dance. Have fun with it. The more fun you have, the more fun your child will have. Singing is a great way to engage with music. 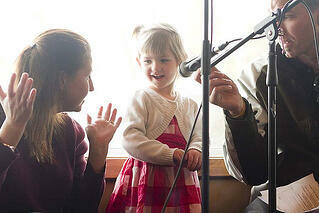 Sing to your children whenever possible. Lullabies are great! Let them hear your voice to soothe them to sleep. Let your children join in and sing with you. Turn up the tunes and sing! You don’t have to be a great singer for this to be effective. You can even make up your own songs. Sing about the groceries you have to buy at the store. Sing about patience while you wait in line at the grocery store. Drive through town and sing about the sites you see. Let your creativity flow and encourage your kids to join in and make up their own songs. Write a theme song unique to your child. You can sing about their unique qualities and likes or how much you love them. Another great option is to make their theme song include their name and how to spell it. Not only will they be engaging with music but they will learn how to spell their name at an early age. So many children’s books include music. Your child will enjoy reading about beloved characters singing and dancing. It can certainly help build a love of music in your child’s heart. Check out this list of music-themed children’s books. Have a mess to clean up? Challenge your child to put away their toys before the song ends. You could even designate a song as your clean up song. Turn it on and race to clean up all the toys. Chores can be fun and exciting when you include music. Alarm clocks are loud and harsh. Why not start your child’s day with a soothing song? Wake them slowly with a soft calming song. They will likely wake up less grumpy when gently woken up by music instead of that loud, annoying alarm clock. Read this blog for ideas on how to use music to relieve stress. Take your kids to live musical events. Let them dance to the music and see that music is loved by many people not just you and your family. Bring their friends and have a little party at a concert in the park. Enrolling your kids in a music class gives them the opportunity to learn about music. They can learn the history, and how to make beautiful music. Creative Soul School of Music offers numerous music classes for you and your kids. From family sessions to private lessons to rock camp, Creative Soul School of Music has the perfect lessons for you and your kids. 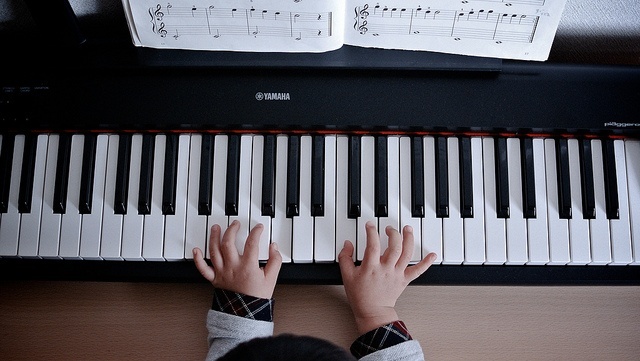 Including music in your child’s life isn’t as difficult as you many have initially thought. Anything musical counts and benefits your child. We listed only 11 of the many ways to incorporate music into your life. We encourage you to try some of these out and even make up your own. How do you include music in your life?